UNIQUE Smooth Endcaps seal the ends of our empty Smooth Firestop Sleeve Systems in new installations or in abandoned sleeves. Sets of 2. UL Classified for up to 2 hours. Made in the USA. 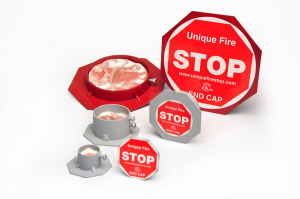 Firestop sleeve systems are not allowed by ANY jurisdiction to be left open and unattended EVER, not even overnight. 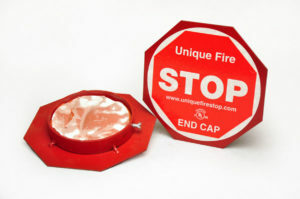 UNIQUE Smooth Endcaps are designed to seal the ends of our empty EMT Smooth Firestop Sleeve Systems in new installations or abandoned/empty sleeves. This is required whenever the installed firestop sleeve system is to be left empty of cables, even overnight or on weekends. The required intumescent putty is included with the Endcap Systems. This firestopping putty should be used to seal the sleeve either permanently or until the new cables are installed and may be used again when the sleeve is put back into service. Endcaps are manufactured in the USA and come in sets of two to seal our 1”, 2”, and 4” diameter EMT Smooth Firestop Sleeves. EMT Endcaps are available in 1″, 2″, and 4″ inch sizes. UNIQUE Intumescent Putty is included. An EMT Sleeve with abandoned cables. After the cables are removed, place the EMT Endcap on the ends of the abandoned EMT system. New cable installation in a reclaimed system. Remember – you may reuse the intumescent putty when the sleeve system is put back into service.